Hey guys! 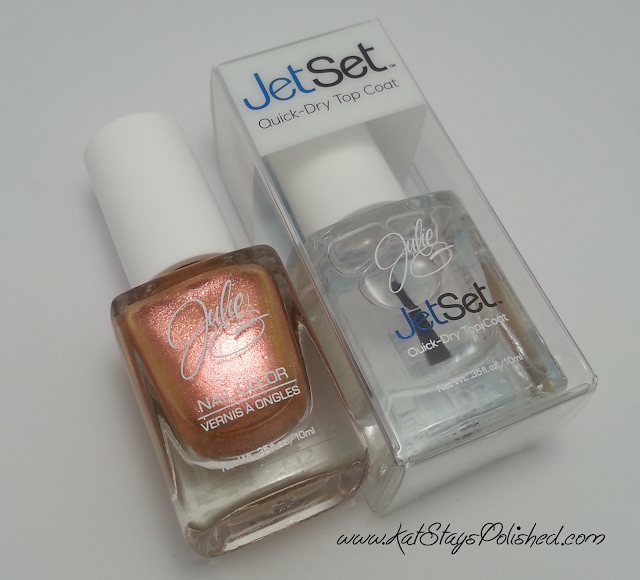 It's time for another new polish in the JulieG core line. I bought some things from Jesse's Girl online last week and today's color was one of them. I also bought their new Jet Set Quick-Dry Top Coat. I used it to top off this color. Let's just get right to it! Here is a closeup of the Golden Sunset bottle. Just WOW! Look at those amazing colors just pop! It seriously looks just like a sunset. Wait til you get to the swatches on my NAILS! Boom! A sunset in a bottle! So, let me be honest here and say that I am very weary of any polish with multi-chrome characterisitics and color-shifting properties. They usually look NOTHING like that on your nail. Well...here's proof that the JulieG Golden Sunset is just like it shows in the bottle. It applies beautifully in 2 coats and is absolutely 100% opaque! I can't even get over how gorgeous this polish is! I also topped it with 1 coat of the Jet Set. This top coat might become one of my faves. So, have I convinced you to get this color to add to your collection? You can find it at your local Rite Aid or do what I did and order off of Jesse's Girl online. At $3.99 for the polish and $3.99 for the top coat, you really can't get any better than that! Stay social with JG on FB, Twitter, and Instagram! *I bought these items at a discounted rate from Jesse's Girl. All opinions are 100% honest and my own. I just bought this tonight at Rite Aid but weird thing is my bottle says Textured on it and the sticker on the handle that says, "for full effect do not use top coat." I swatched on a nail wheel and it seems to be normal texture. I'm guessing it was just a packaging mistake.